ASQ: Ages and Stages Questionnaire; DDST: Denver Developmental Screening Test; NDDS: Nipissing District Developmental Screen; RBR: Rourke Baby Record. Table used with permission from Guttmann, A., Gandhi, S., Hanvey, Li, P., Barwick, M., Cohen, E., Glazer, S., Reisman, J. & Brownell, M. (2017). Primary Health Care Services for Children and Youth in Canada: Access, Quality and Structure. In The Health of Canada’s Children and Youth: A CICH Profile. Retrieved from https://cichprofile.ca/module/3/ -accessed July 25, 2017. 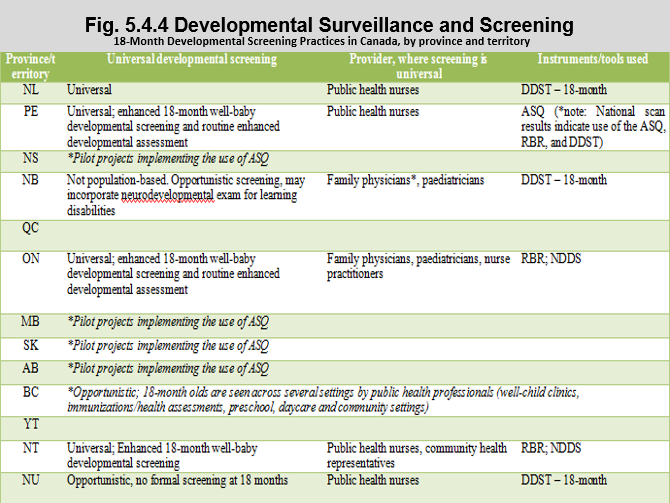 Six provinces and territories – Ontario, Prince Edward Island, Newfoundland & Labrador, Nunavut, the Yukon and the Northwest Territories incorporate formal developmental surveillance or screening as part of an 18-month well-baby visit during routine visits, or around immunization schedules. There is variation in where the screening takes place, which health professionals do it, and the instruments used. Other jurisdictions provide targeted or opportunistic 18-month screening, often without use of formal screening tools. Only Ontario provides additional funding to primary care physicians for this enhanced visit. 1Williams R, Clinton J, Canadian Paediatrics Society. Getting it right at 18 months: In support of an enhanced well-baby visit. Paediatrics and Child Health 2011;16(10):647-50. 2American Academy of Pediatrics. Eye examination in infants, children and young adults by pediatricians. Pediatrics 2003;111:902-7.